It's the weekend before Halloween! Time for pumpkins, mini candy bars, and dressing up! 1. Spell on Wheels - a new comic book series that just sounds absolutely fantastic. It's described as "Supernatural meets Buffy and The Craft". 2. 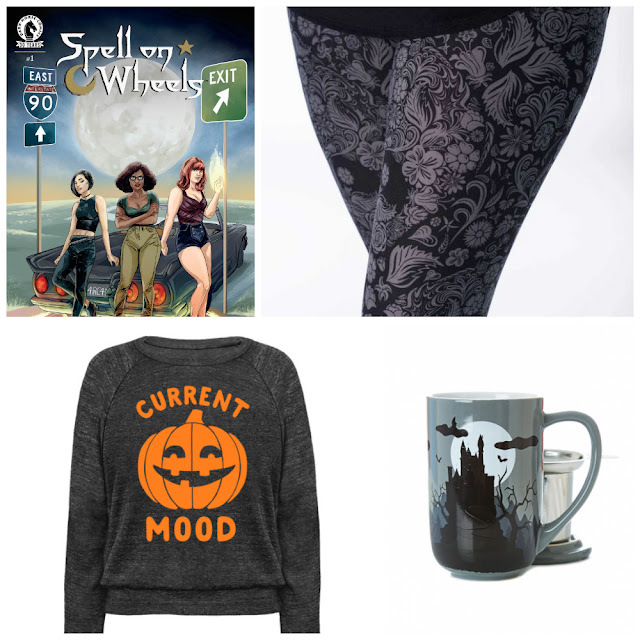 Dark Night Leggings - I think this pattern from Sweet Legs is gorgeous and would be perfect to wear with a witch costume and then with every dress I own. 3. Haunted Castle Mug - Davids Tea released a great Halloween collection this year and I'm so loving the Haunted Castle mug and travel mug. 4. Current Mood: Halloween Pullover - As usual Look Human has some fun Halloween-inspired designs which are perfect for this time of year. I would definitely wear this sweater throughout October. What tops your favourite Halloween things now?